This activity may be applicable in a wide range of different climate science courses, units, etc. in high school and college. This assignment could be used in a science class to broaden communication skills, or it could be used in a humanities or writing course to strengthen science skills. The activity is deliberately designed to be used either way. 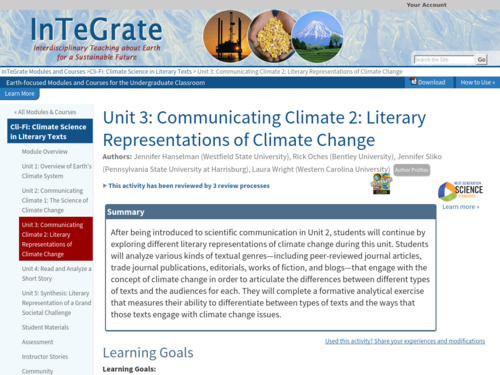 This activity can follow Unit 2 (of the InTeGrate module Climate Science and Literacy Texts), or it can be taught as a stand-alone unit that focuses on literary terminology, climate change issues as represented in fiction, and rhetorical analysis. Educator should be sure to have a scientist/mentor, if their background in climate science is weak, to answer questions that may arise. This activity deals with climate change literary genres, by exploring different texts and analyzing how those texts engage different audiences about climate change concepts. Students analyze various kinds of textual genres â including peer-reviewed journal articles, trade journal publications, editorials, works of fiction, and blogs â that engage with the concept of climate change in order to articulate the differences among different types of texts and the audiences for each. The intent of this exercise is for students to learn how to interpret a text and consider different approaches and perspectives. Students also gain an understanding for how climate change is treated in different forms of literature. Students work independently and in small groups and discuss their analysis with the whole class. This activity is complete and it contains handouts, links to readings, a PowerPoint presentation about rhetorical analysis, examples of completed analyses, teaching tips, and a grading rubric.